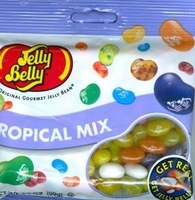 Jelly belly tropical mix jelly beans. The delicious flavor of these yummy jelly beans will have you drifting off to your own tropical island. Each bag has an assortment of 16 different tropical flavors. A few flavors are lemon lime, mango, banana, pink grapefruit, strawberry daiquiri and island punch. Now you can enjoy the taste of the tropics without even leaving your home. Mix a few of the tropical flavors together and create your own tropical blast. Don't forget to also get a bag of the original flavors, fruit bowl flavors or the soda pop flavors. There is even a sour mix of jelly belly's for those of you who enjoy things a bit tangy.